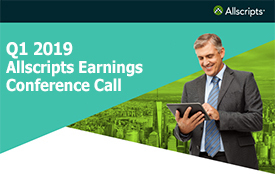 CHICAGO, Sept. 17, 2018 (GLOBE NEWSWIRE) -- EPSi, Allscripts (NASDAQ: MDRX) flagship budgeting, long-range planning, cost accounting and financial decision support platform, announced a partnership with Ilerasoft, Inc. to offer clients additional capital budgeting capabilities and to provide analytics to help improve operational efficiency around medical [capital] equipment use powered by Ilerasoft’s Efficiency Score. The Ilerasoft solution contextualizes medical equipment use with financial, operational and patient population metrics, and then provides recommendations to improve utilization and reduce costs, enabling decision makers in finance, supply chain and clinical engineering to use their own data to make long-term capital budgeting, resource allocation and purchasing decisions. Ilerasoft’s algorithm extracts relevant data from purchasing, asset management solutions and utilization to determine the Efficiency Score for a given medical equipment, which can serve as a “value score” for medical equipment. Once providers know this score, they can better analyze and make decisions to improve utilization, operational efficiency, and capital budgeting. Organizations can aggregate the Efficiency Score at the equipment category or hospital department level and benchmark scores internally or against hospitals with a similar profile. EPSi is an industry leader in integrated financial decision support, budgeting, and planning solutions for the healthcare industry. More than 950 hospitals in the U.S., including nine of the top 10 rated hospitals, 130 IDN systems, and 40 global academic facilities rely on EPSi for data-driven insight into managing costs and improving their long-range financial performance. Learn more about EPSi at www.epsi.io. Ilerasoft is focused on providing cutting-edge technology for hospitals. The company operates on the thesis that at the intersection of intelligent technology and hospital operations lies the solution to reduce costs, improve operations and enhance patient outcomes. Learn more about Ilerasoft at www.ilerasoft.com. Learn More About Allscripts Solutions. Contact Sales Now. © Allscripts. All rights reserved.